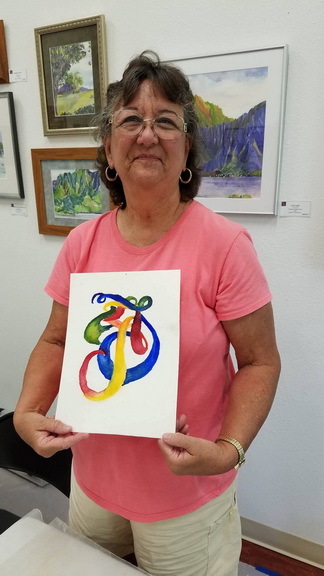 Color enhances our moods and in this all-inclusive two-hour workshop Watercolorist Dawn Yoshimura will share her simple color theory for creating happy, bright, harmonious colors using watercolor. 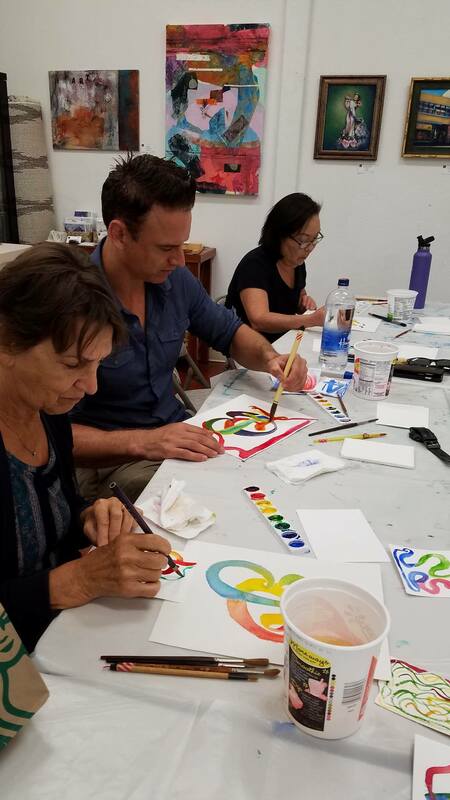 Using a basic rhythm to paint intuitively and fluidly using 3 basic strokes–you’ll soon be painting gorgeous color creating your own original Color Bridge painting to take home and enjoy! The design is based upon Dawn’s painting “Mikata: My Ally” from her calligraphic abstract series ‘Color Bridges’ but each painting is a result of your own unique creative expression. Enjoyable for all levels, ages and genders. I do this for children 7-11years but please book a private session. Today’s event is for 16years and older. What must I bring to the event? This is all-inclusive, so it means you just bring yourself! I provide the paint, paper, brushes, water, paper towels, etc. You will also receive a link to download an English copy of my coloring book valued at $12 as well as a printed version in Swedish valued at $10. Do I need to know how to paint? I’m not very artistic. No! You don’t have to know anything about watercolor or painting. I’ve had many students who had never tried before, such as engineers, nurses, lawyers, actors, or even other artists who had never tried watercolor before and they all had a great time and were pleased with their paintings. There is no refund but you can send someone in your place or book a place in a future event within 12 months. You can also book a private session with me but must book an additional minimum of 3 other friends. I hold at least 2 open Color Bridge workshops a year but most people tend to book me with a group of their friends or coworkers at a date that is convenient to them. Yes, as stated above, life happens, so if you find you can’t make it, contact me to let me know who you are sending in your place so when they arrive, I will know.